You must make reservations at least 5 minutes in advance of the time at Poets Modern Cocktails & Eats @ Hotel Indigo Baltimore. Poets Modern Cocktails & Eats offers a creative food and drink scene that reflects the vibrant aesthetic of Hotel Indigo. Enjoy eclectic regional cuisine and share fare, including sandwiches, salads, burgers and flatbreads, sourced from local farms when possible. Start with our Camden Yard Sliders and savor delicious entrees, including the Maryland Crab Cakes or grilled Rib Eye. 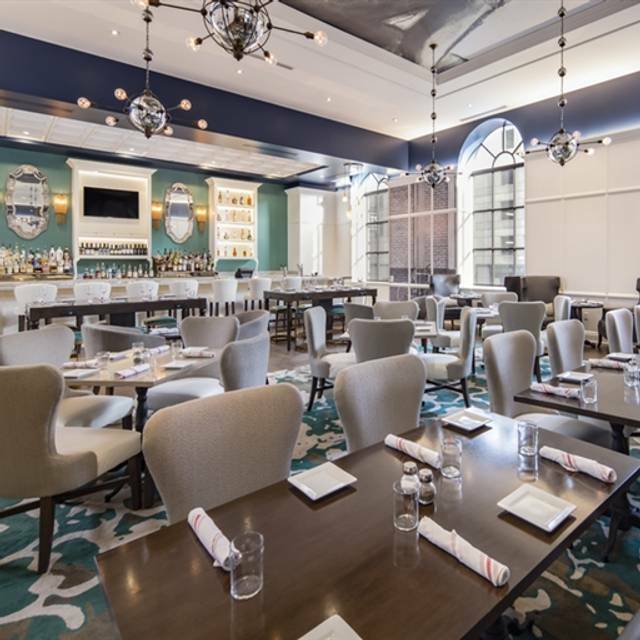 Enjoy classic and artisan cocktails, including the Build Your Own Manhattan, a fabulous wine list, and local and craft beers.With its warm, playful and contemporary vibe, Poets is the place you'd go for lunch with friends or your last sip of the day. Excellent service and food! The cocktails could be a little better overall but we had a great experience! Please get your cappuccino machine fixed. The most impressive aspect of Poets is the ambiance. In addition to being an embracing space, the very high ceilings reduce echoes; we didn't hear other table conversations and they didn't hear ours. Our waiter was calm and efficient, so we felt unhurried and comfortable for our meal. The crab dip appetizer was traditionally delicious. My Lexington Market salad was perfectly seasoned and adorned with salmon, shrimp, and crab balls with characteristic flavors. My companion's burger was delightful. Cocktails were interesting, wine was refreshing. The icing on the cake was the free parking at the garage across the street. We look forward to visiting again soon. This was our second visit to Poets. The first time we loved it. This time it was awful. The good: the cocktails were excellent as was our server. The bad: (1) how could the server not know that the kitchen was out of rockfish? (2) all the food was over cooked. The steak, chicken and tuna were all not cooked to order and were dry. The steak was the worst looking piece of meat we had seen and was extremely small for the price. Our guest who ordered the crab cakes said they tasted as though they had been preformed and frozen. They were loaded with filler and how no lump crab meat in them. Our server tried to make up the rockfish mistake with free desserts but we were rushed to get to the theater. We like the restaurant but can not recommend it until the kitchen gets its act together. Oh, we were there early (6 p.m.) and there were no more than 3 tables dining so it’s not like the kitchen was swamped. The service was wonderful and the food was amazing. Great Tuna and crab cakes. Service smooth as always. This is my "Go To Place" , quality service, fresh tasty food and good atmosphere. This is a nice hidden gem in Baltimore. We had a large late-night after-theater group, old high-school friends catching up after 30 years. The staff seated us in the library, which was lovely, as we could talk and laugh. The service staff seemed to understand us and were patient while we took forever to get around to looking at menus. One of us had a 12-year-old in tow, and the waiter brought her food long before the rest of ours; that was a sensitive touch. The food itself was great (pears and goat cheese crostini, artichoke dip, crab soup...) We will happily come back. Food was very, very good! Unfortunately the service was fair. Entree came out right after appetizer, so hamburger was cold by the time I got to eat it. Also thought one of the servers was not accommodating when we first came in, so didn't feel comfortable from the beginning. Food was great. Especially from just picking randomly. The atmosphere and decor was really cool. But the food was ok and service was terrible. After asking for our check, it took them 20 minutes. Our dinner was rushed because the kitchen was slow, and we were going to a concert nearby. Later arrivals seemed to be getting their food before we did. It wasn't clear whether the kitchen was overwhelmed by a larger crowd than usual for a Tuesday night or whether something happened to our order. The drinks were good, as is the setting. The food was good, when it finally arrived, although we needed to eat in 10 minutes. To compensate for the delay, the manager reduced our bill. The day we visited there was a party in the room next to the cafe. The noise wasn’t too bad but it was distracting. Everyone wanted to see the fashion show! As for the meal, it was good. The appetizer was sold out so we substituted with the crab dip which was very good. The shrimp bowl was very well prepared (the shrimp was clean and perfectly cooked) but the orecchiette pasta was too chewy and was stuck together. The following day, I pulled the orecchiette pasta apart and steamed to soften. It was much better as lunch. The huge vegetable plate was tasty and different. The leftovers were delicious with homemade marinara sauce and pasta. Our guests liked their crab cakes and chicken bowl. One guest wanted to return to have the same meal we had a few months ago. The items were on the menu but sold out. She was very disappointed but liked her crab cake. We were a bit disappointed but the quality was good. The atmosphere is cozy and the decor is very interesting. Our server appeared to be new but he was very pleasant and helpful. From this visit, we could only say it was good overall and we would visit again. Service was slow, even though there were only two other tables of two filled. Very, very disappointing, and even though they took a lot of items off the bill, I'm afraid we won't be back. Management really missed the mark. We made reservations for 7, two weeks in advance, and when we arrived we were seated in the middle of a huge fund raising happy hour. We couldn't hear ourselves even think over the noise of the crowd and glasses breaking on the floor, not to mention people were constantly bumping into our chairs. We left after 1 drink and ate elsemore conducive to conversation over a meal. I would have appreciate a proactive phone call to explain the situation and give us a chance to reschedule. This is the perfect spot for lunch or a light evening meal. The burgers and sliders are delicious. Not the best burger, not the best martini, but an enjoyable experience nonetheless. 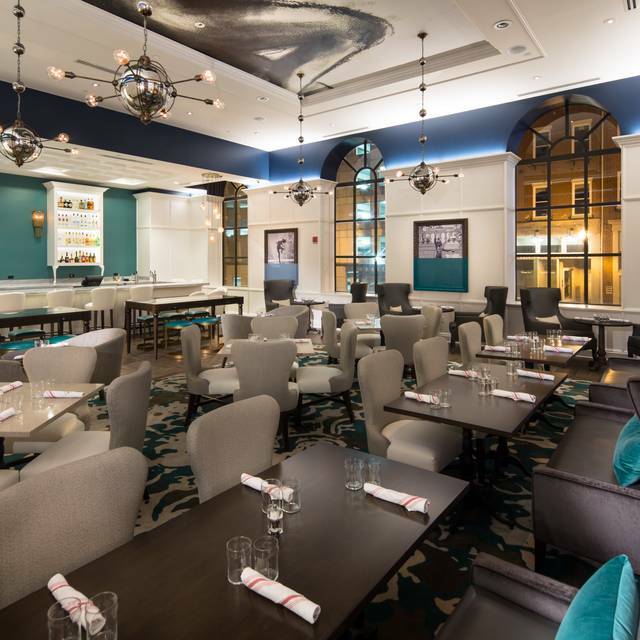 Fare was good (if not memorable); service was prompt, friendly and efficient; and the room—really a large lobby bar in the Hotel Indigo—is delightfully airy, light and spacious. We came in as a group of 3 co-workers for restaurant week lunch. The curried vegetable soup was delicious, the Maryland crab soup was delicious. The Lexington Market salad was beyond our wildest expectations! There was so much protein in that salad, it was VERY satisfying for all three of us! Yes, we all ordered the same thing. One of the best steaks I have ever had and I’ve had from some of the best. Great ambiance, nice vibe. I was treating a table of four. The food just didn't match the hype. If I'm going to pay $15+ for an appetizer and $28+ for an entree I expect it to be "good." My meal consisted of a bowl of orzo (not completely cooked) with four shrimp. I'd have given anything for a bottle of sauce of ANY kind to pour on top of it. Funny thing - we left and on the drive home - stopped at McDonalds for fillet of fish sandwiches because we were still hungry. I see why the dinning room was empty on a Saturday night. Thanks for asking. Also, tell Hotel Manager - Jason Curtis I said hi. I have been here before and often use it is a location for business meetings. We had a large party and I made a reservation ahead of time. When we arrived I was told that we would have to sit at two tables, as it was their policy not to put tables together. I explained that we were a group of 9 for a business meeting and required that we all sit at one table. The waitress argued with me for over a minute before another server came over and put the two tables together. I will seek out other locations in the future if I have large business meetings. Drag brunch is always a blast! The manager went out of her way to accommodate our party, the server was fantastic, food was very good! Great ambience, nice Decour, and most importantly live jazz on Wednesday nights! We brought three young children and there was no problem, the service was fantastic and we enjoyed ourselves tremendously. My first time here and I saw many good reviews and was excited to see for myself. T My date had been there before and was looking forward to going again. We both got the Lexington Market Salad. his was a Saturday afternoon around 2:30 pm and we were the only ones there for about an hour - ninety minutes. The seared salmon (my date substituted another crab cake for the salmon) and blackened shrimp were good but the mini crab cakes were not very good. They were more CAKE than crab and the cake/bread was what you tasted. The crab that was included was finely shredded. It was so tasteless that she asked to get a piece of chicken as a substitute on a new salad. I just did not eat the crab cakes. It took awhile to get that and than the chicken was okay but they had to make more croutons (who runs out of croutons). When the croutons came out they toasted like toasted bread. Then we got the bill and i slipped the card in and it sat on the table for about and hour while we chatted and then I called her over and paid so we can go. The food choices were not the best for a brunch. Everything else was great! Very modern decor, wasn't crowded on a Saturday night which is a great thing for me. Service was great and friendly Taylor our server was very attentive . I ordered the Lexington Salad which was delicious and very filling. The crab cake entree my wife ordered was okay wouldn't order it again. Overall great experience will come back again to try the cocktails and happy hour menu. Service was slow and not helpful. We never got the bread we requested. Had to look far and wide for our server to get coffee st the end of the meal. The salmon - which I generally find to be foolproof- was dry, over cooked and tasteless. This is a hotel restaurant- and not a very good one. Hidden gem with good food, great service and nice decor. If you've never been, try it. Our waitress was exceptional. The food was excellent. I really enjoy the clean look of this restaurant. Beautiful place. I wanted to support Baltimore Restaurant Week so I chose to go there. The food was okay. The service was REALLY SLOW and there were barely any people there. We went for Restaurant Week and pre-theater show. The seating is cozy if the chairs are a little low to the table. The bar is very nice-looking. And the ceiling art is a nice touch. The appetizer and make-your-own Manhattan menu were fantastic. They were a great start, but also the high point. The service started very good but they were busy and we waited a very long time for the last course and had to request the bill at the same time to rush to our show. The main course was good but not great and disappointing for Restaurant Week. There were four in our party and this was the first time at Poets Modern Cocktails and Eats. The setting was very comfortable with interesting decor. It was comfortable and classy. It is a small restaurant in Hotel Indigo. Our Server was very friendly and was anxious to please. He recommended a few items and it proved to be a good suggestion. Three of us had sandwiches, the chicken special wrap, Ahi tuna and another chicken sandwich and one had a crab cake dinner. Everything was prepared well and tasted good. Two had their Vidalia onion and potato soup and said it was absolutely delicious! One had the soup of the day, beef vegetable which was also flavorful. The last rating was the vegetable soup. Salt and pepper helped but it needed something else; however, it was very healthy. We will definitely visit again! It was a lovely, relaxed early dinner. All of our party agreed that they would recommend it to their friends. Always very nice!!! I have been attending their restaurant since they opened and continue to maintain good service and food. THANK YOU! A great spot for a bite to eat before heading to the Basilica. An awesome waiter and great food made for a perfect before concert venue. Chairs are not the most comfortable and drinks are pricey.